Purchasing a new car can be an extremely time-consuming process. There are so many makes and models available for sale, and it’s hard to determine if you are really getting a good deal when you drive your new vehicle off the lot. Buying a car doesn’t have to stress you out. If you are prepared when you go to look at a car, you will know what to expect. This is especially true when you test drive a potential new vehicle, and the experts at Drivers-Licenses.org know what you should be aware of when test driving a car, so you don’t make a purchase that you later regret. Going to look at a new car can be exciting, and you don’t want to get overwhelmed by the vast amount of choices available to you. It is important to know what you are walking into before you even pull into the car lot. You should narrow down what car features mean the most to you. The team at Drivers-Licenses.org recommends focusing on a car’s overall dependability and safety standards. You should research different dealerships and their overall ratings within the community. Make sure you are going to a reputable dealer that will not end up selling you a lemon. 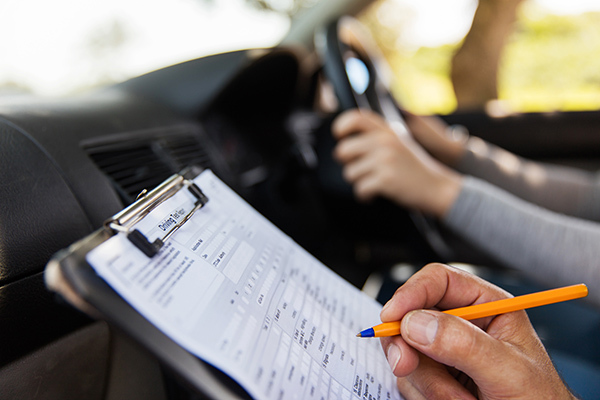 Develop a laundry list of questions to ask during your test drive. This will show the salesperson that you have done your homework and that you know your stuff. It also gives you an opportunity to learn more about the car and make sure all the features you want are included. Before you open the door and sit inside, be sure to conduct an inspection of the outside of the car. You will want to take a close look at all four tires to make sure the tread isn’t worn down. The expert team at Drivers-Licenses.org recommends making sure there is at least a quarter inch of tread on each tire. It is crucial to check under the car for any leaks; no one wants to purchase a car with a major problem. You should open the hood and make sure no loud or weird sounds are coming from the engine. Ensure the doors and windows open and close properly. Have the salesperson turn the blinkers and headlights on and off so you can make sure they work. During the actual test drive, pay attention to how the car responds while going different speeds. See if the vehicle pulls to one side, or if the steering wheel shakes at a higher speed. The experts at Drivers-Licenses.org insist that paying attention to how a car feels during a test drive can make all the difference. If anything seems off, consider car shopping elsewhere. A salesperson may take a test drive as a chance to sell you on the vehicle. You must remember that you are in control. Remember to ask any questions about the car you may have. Don’t let the salesperson convince you to look at a different or more expensive model if that is not what you ultimately want. It is important to stay firm in what you are looking for, and this includes your price range. If a salesperson seems to want to rush through a test drive and get you back to the office to make an offer, you may want to rethink purchasing the car. The salesperson should be trying to meet your needs, not the other way around. Don’t settle for bad service, because it could lead to a bad car purchase.